In my last post I wrote about the issue of interrupted “zone-ish-ness” – that is, what happens when we are in the zone for a sermon and something comes out of nowhere and knocks us so that we wobble? 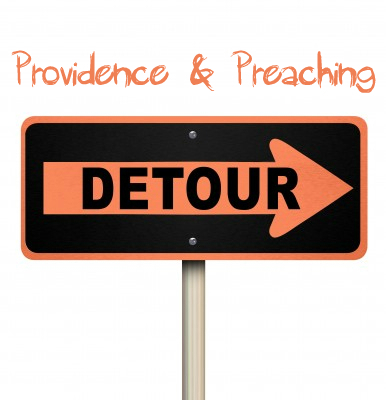 I say let’s learn to trust God’s providence and become better preachers. Unsolicited information may be pure gold – One of my most creative sermons was never preached. Probably a good thing, too. I had this great idea to preach Ezekiel 16 from another room. That is, it would just be a voice speaking out to the gathered people, perhaps in low lighting. The idea was developing nicely, and then the chap giving the church announcements made the suggestion that people might like to bring their friends along to that particular event. Uh? No! Oh wait, perhaps the creativity was a little off target anyway. I’m glad I didn’t preach that without thinking through the very real possibility that guests would be present (announcement or no announcement). Hearing just before standing up to preach that such and such a person is present, and is struggling with this or that harsh reality . . . this can be pure gold information. Suddenly a message that was true and good can become targeted and precise. It does involve prayer and a bit of thinking in the final minutes before preaching, but perhaps that is exactly what the message needed? I know I was planning a message recently and it was a bit flat. A comment from my wife about a conversation she’d had could have sent me spinning, but instead I thank God for that piece of information – it reshaped the message for good. I remember finding out as I stood up to preach a 20-25 minute message that it had to last exactly 65 minutes. Not sure I did so well there, but maybe someone listening needed the extra repetition and reinforcement that they got as a result! There are many times when we find out information a bit later than we might have preferred. It could be about the listeners. It could be about the church. It could be about the passage (hopefully not). Whatever it is, let’s be leaning on God and trusting Him to be providentially in charge, since, after all, He is.